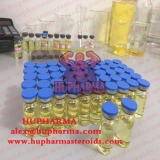 Masteron (Drostanolone) is a unique anabolic steroid because of the way it is derived from DHT (dihydrotestosterone). It is altered by the addition of a methyl group at the carbon 2 position. This structural change is what makes masteron anabolic, and what makes it function the way it does. Masteron is extremely popular in bodybuilding; in fact, it’s used in cutting, hardening, and even as an aromatase inhibitor (AI). This makes it a great choice as a finisher during a cycle; though, it should always be stacked with other steroids to get the most benefits out of it. It is especially a good choice with aromatizing compounds like testosterone and dianabol because it works in synergy to counteract estrogen based water weight.